When you write a book is it gone over countless times. The amount of hours I spent editing At First Light could challenge the hours I spent writing the actual story. Not only was it my eyes looking out for any errors but the eyes of my editor and beta readers also. With all this in place there was one very keen eyed reader who found an obvious error that had me laughing. Within the ebook version of At First Light there are two chapters labelled as being chapter thirteen. 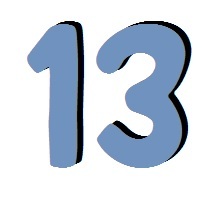 I can’t say I’m superstitious at all when it comes to the number thirteen, and there sure have been a few things in my life that have happened on the 13th of a month, including my wedding! It is also 13 weeks from today until the release of A Second Wind which will be out on the 13th of December. I had hoped to have the book released late October, but have had to push it back a little due to committments in my role as a teacher. The good news though is that book three of the Mount Kiernon series is still slated for release March 2017, which isn’t changing. Hooray! And to the reader that found the error, thank you. You caught it just before the manuscript went off to the printer for the paperback version of At First Light to be printed. For that you have my heartfelt thanks.